Use Figure 4 to answer the following question. Select the best answer by checking the appropriate box. 3. Does exercise affect the gender difference in heart rate? Yes, exercise reduces gender differences in heart rate. There is a significant difference between men and women pre-exercise, but not at 20 or 30 minutes of exercise. 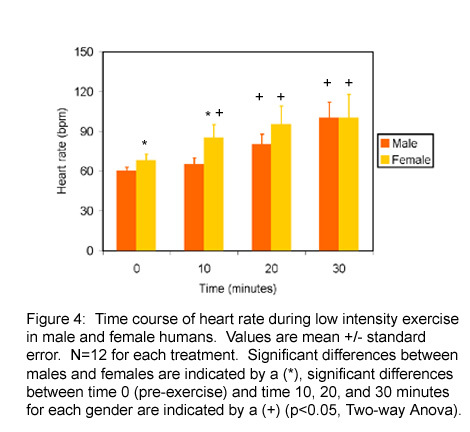 Yes, exercise enhances gender differences in heart rate. The difference looks bigger at 20 minutes than at time zero. No, there is no gender difference in heart rate. No, there is basically a gender difference at all times. We would probably see a difference at 30 minutes if there was less variability.